I remember saying to myself, "I've gotta find one of those!" when I first learned that there was a hawk that shared my last name. It took months and the help of an experienced birder to see my first Cooper's Hawk. We found it eating a Starling in a large Cottonwood tree on a cold December morning. I walked up to the tree and took a picture with my weak little point and shoot camera. The hawk was so fixed on eating it didn't mind that I was standing right below it. The camera equipment I have today would have produced some prized images, but the little point and shoot I had that day captured just enough of an image to remind me of the experience. I believe that experience may have been a tipping point for my desire to photograph birds and other wildlife. Once I saw that first Cooper's Hawk it was as if a Cooper's Hawk radar was installed because I began to notice them and their smaller relative, the Sharp-shinned Hawk, regularly from that time onward. I wanted to expand my experience with these hawks so I "hatched" a plan to look for possible Cooper's Hawk nest sites during the winter months while old nests were exposed in naked trees. I made note of several possible nest locations and then I began to check on those sites as spring rolled around. One potential site that I checked on last week had three different nests that seemed fitting for a Cooper's Hawk. All three nests were in a small stand of trees just a few miles from my home. Just moments after eyeing the three nests and finding them empty I started scouring the limbs of the trees from mid-level downward. I felt like I hit the jackpot when I locked in on a female Cooper's about 20 feet above the ground. She seemed rather comfortable with my presence below her so I wondered if she was feeling at home, so to speak. That gave me hope that she was near her nesting site. Two days later (April 21st) I went back and found what I think was the same female perching upright in one of the three nests I had previously checked. Her upright position gave me the impression that she probably didn't have eggs in the nest. I suspected she was preparing to lay eggs at that point in time. Two more days passed and I went back (April 23rd) to check on the nest again. A storm front with extremely strong winds had blown for several hours during the evening before. Lots of branches and debris were on the ground below and around the small stand of trees. It appeared that the nest was empty from my initial vantage point. A chunk of the twigs on the lower half of the nest appeared to have been displaced by the strong winds from the night before. I walked a complete circle around the perimeter of the tree and then noticed mama hawk's tail protruding from the west side of the nest. Her hunkered-down posture in the nest led me to believe she was officially on eggs. 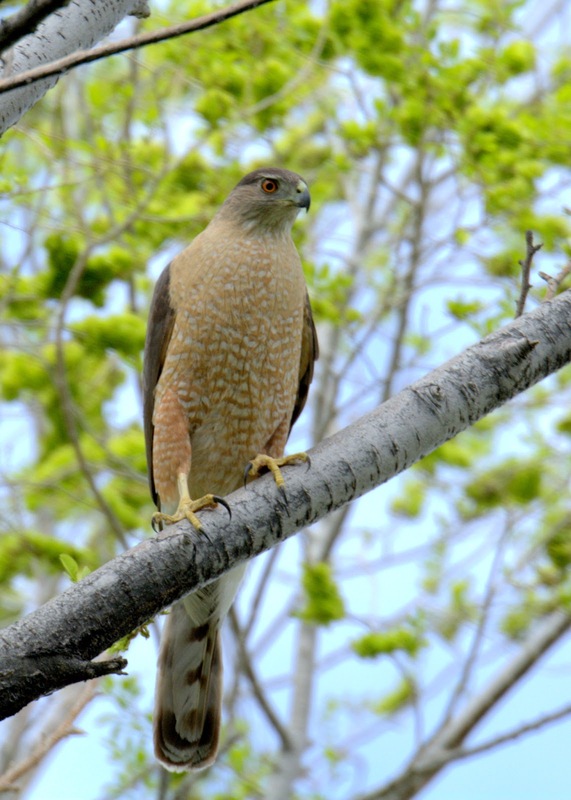 Cooper's Hawk nests are actually built by the male of the pair. They will use nests from previous years and I suspect that they sometimes rotate among multiple nests from year to year. The male provides the food for the female and then the chicks for nearly three months from the time mama starts incubating eggs until the young birds leave the nest. He will capture mid- to small-sized birds and kill them by repeatedly squeezing them with his talons as he holds them away from his body. He generally will pin them to the ground, away from his head and chest, until they die. Other birds of prey often kill their prey with biting, but that is not the way of the Cooper's Hawk. These hawks have one brood per year with 2-6 eggs. The periods for incubating and rearing the young take about 35 days each for a total of nearly 70 days from laying eggs to fledging. I've been watching another Cooper's Hawk nest site that is a little more secluded and on private property owned by a friend. The images below include the female of that pair as well as a view of the nest before it became obscured by leaves. 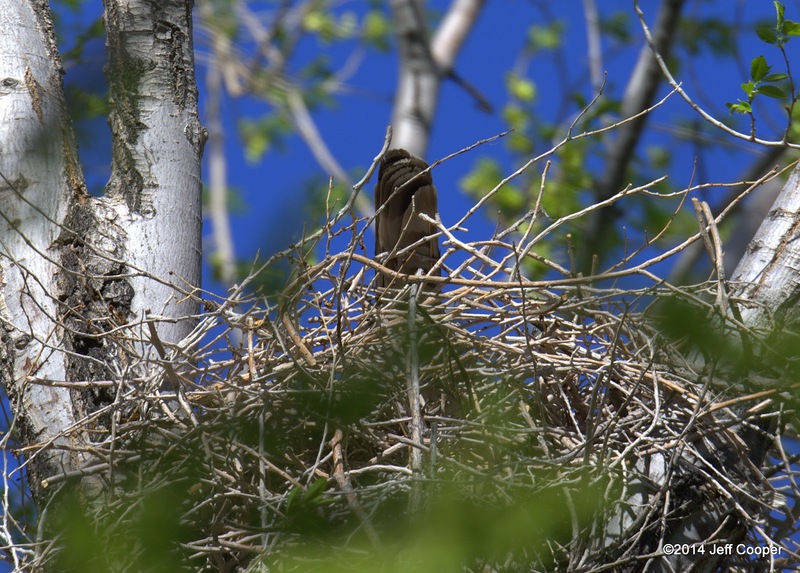 Nests are usually about 30 or more feet above ground in wooded areas. I am protective of the nest sites and roosts for certain species, especially owls and some falcons and hawks. I've had a few situations where I have shared these locations only to soon learn that the birds were disturbed to the point that they abandoned the site. If the nest is in a relatively safe location I'll share so others have the opportunity to witness unique glimpses into the lives of the birds. Otherwise, I'll keep them safe by not spreading the word. I hope to follow up on this post with multiple posts as these nest sites progress. Thanks, Jeff. I'm glad you found it informative. Looking forward to to continued progress of these Coops. It's fun to watch these birds, Laurence. Patience will be my challenge over the coming weeks. Thanks for stopping by. I spend a great deal of time and resources to obtain the images I share on my blog. Copyright laws declare that I own and retain all rights to my images. Please don't download, copy, reproduce, or distribute these images without my permission. I generally enjoy sharing so please ask if you would like to use any of my images for any purpose other than viewing them on my blog. If you see any images you want to have printed professionally or have any questions you can reach me at jeffcooper7@gmail.com. Sunshine's Got Me Humming for Hummers!